On Monday, December 18, Pope Francis promulgated the decree recognizing the heroic virtues of Father Patrick Peyton, a priest of the Congregation of Holy Cross, thus recognizing him as Venerable by the Roman Catholic Church. The Positio on the life, virtues and reputation of holiness of Father Peyton had previously been discussed and approved by a panel of nine theologians and more recently by a group of 15 Cardinals and Archbishops who voted affirmatively to recognize his heroic virtues. The Positio refers to the volume containing the evidence that was collected from witness testimonies and supporting documents during inquiries carried out by special tribunals in several dioceses. Hundreds of testimonies to Father Peyton’s heroic virtue and holiness of life have been recorded. Please join us in celebrating this joyful news! The Church canonizes holy people not for their sakes, but to present them to the faithful as models of the Christian life and as powerful intercessors. In their triumph over the challenges of life through faith, we are inspired to trust God more fully and to serve others more generously. Father Peyton and Mother Teresa. The Church studies the life and works of those who are being proposed for canonization for evidence of the gifts and fruits of the Holy Spirit, for humility and prudence and prayerfulness, and for the theological virtues of Faith, Hope and Charity. The Church also wants evidence that after their deaths the memory of these individuals continues to inspire the faithful to pursue holiness and to seek their intercession, so reports of favors requested and received must be kept. Extraordinary healings must have medical records, doctors' assessments, and proof that the healing is attributable to the person being proposed for Beatification/Canonization. 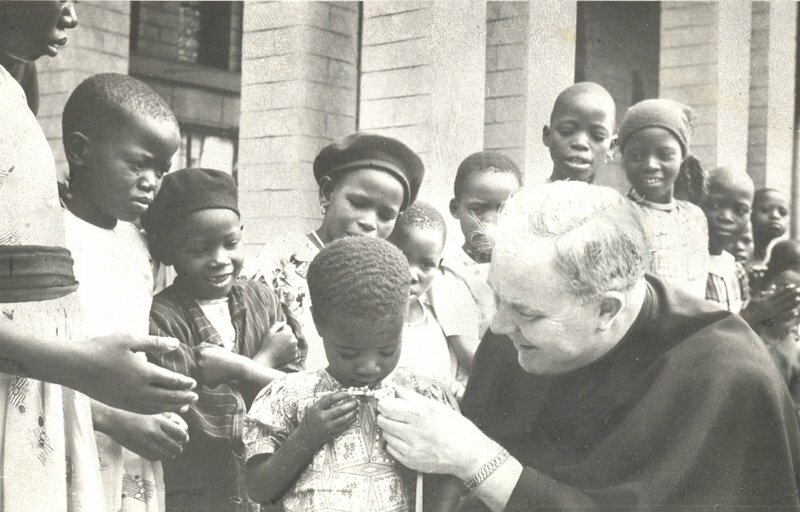 Father Peyton explains the Rosary to a little girl in Africa. a. Testimony is gathered to examine heroic virtue and the sanctity of life. b. Candidate's historical and theological writings gathered and reviewed. c. If approved, all collected documentation is sent to Rome. The Postulator writes a formal summary of the heroic virtues and life of holiness of the candidate (Positio), which is sent to the Congregation for the Causes of Saints at the Vatican for review. The candidate is declared Venerable after a favorable judgment of the documentation by the Congregation for the Causes of Saints and Papal approval. The candidate is declared Blessed by the Holy Father once a miracle is investigated and attributed to the intercession of the Venerable. The Holy Father declares the candidate to be a Saint after a second miracle is attributed to the intercession of the Blessed. 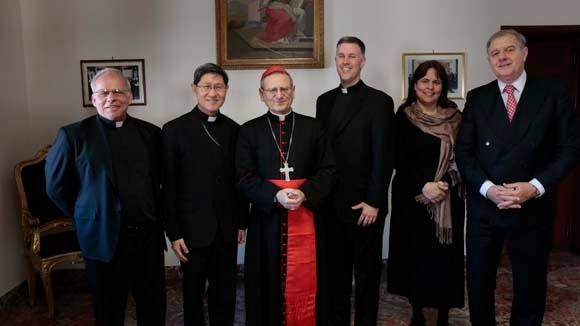 Presenting the Positio are (left to right) Father Willy Raymond, C.S.C., Cardinal Luis Antonio Tagle, Cardinal Angelo Amato, Father David S. Marcham, Nina Bartulica, and Dr. Andrea Ambrosi. Venerable Patrick Peyton’s Cause reached a new milestone in April of 2015 with the completion and presentation of the Positio—a 1,300 page report that studied his life and ministry for heroic virtue and sanctity of life (holiness). The Positio is the synthesis of the Diocesan Inquiry (6,000 page report that included interviews with people from Father Peyton’s life: childhood to death, study of his academic life, ministry, writings, and homilies, etc.) which was conducted in 35 dioceses around the world and completed by the Archdiocese of Baltimore in 2010. On Monday, December 18, 2017, Pope Francis issued the decree recognizing the heroic virtues of Father Patrick Peyton, C.S.C. He is now called Venerable Patrick Peyton. The third stage of Sainthood requires a miracle to be officially attributed to the candidate. Miracles are considered by the Church to be signs of the holiness of the candidate for Sainthood and his or her closeness to God in the afterlife. Their evidence must prove of supernatural healing not explainable by medical treatment or scientific reasoning. There have been two possible medical miracles connected to Father Peyton’s intercession that have been studied in their home dioceses. Now that Father Peyton has been declared "Venerable", these possible medical miracles can be reviewed and an opinion can be rendered by the Congregation for the Causes of Saints. They will select one of the two and begin their study. Dear Jesus, Father Peyton devoted his priestly life to strengthening the families of the world by calling them to pray together every day, especially the Rosary. His message is as important for us now as it was during his life on earth. We beg you, therefore, to hasten the day of his beatification, so that your faithful people everywhere will remember his message that the family that prays together stays together, will imitate him in his devotion to your Mother and ours, and will be inspired by his holy life to draw ever closer to you with childlike confidence and love. Amen. Prayer Requests, Prayers of Petition, or Intercessory Prayers are prayers in which we are asking God to assist us. They are prayers in which we recognize our dependence on God and thus give praise to God. Prayer for a Favor through Venerable Patrick Peyton, C.S.C. God, Our Father, your wisdom is displayed in all creation and the power of your grace is revealed in the lives of holy people, who inspire us to trust you more fully and to serve others more generously. 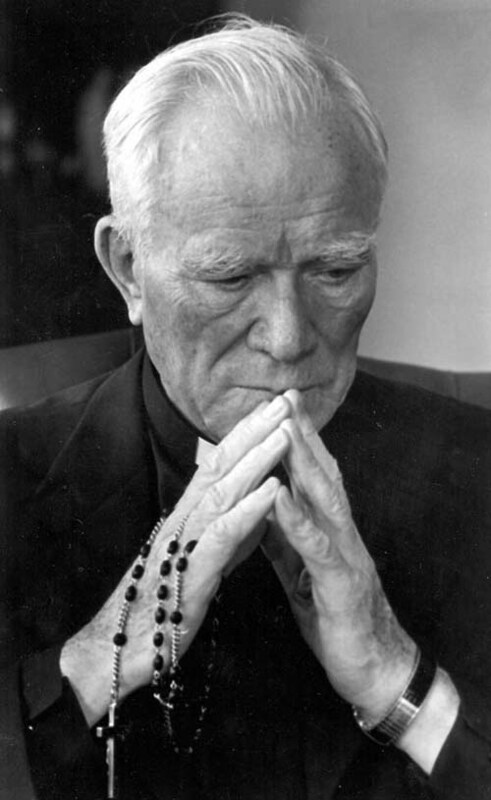 In a unique way, you blessed the life and work of your servant, Father Patrick Peyton, C.S.C., and made him a fervent apostle of Mary, Queen of the Holy Rosary and Mother of us all. Through his intercession, we ask for this favor.… Please grant it, if it is for your honor and glory, through Christ Our Lord. Amen. Father David S. Marcham invites those who have received favors through the intercession of Venerable Patrick Peyton in response to prayer requests to forward that information to him. While we accept anonymous requests and reports of favors, it helps the Cause if you provide your contact information, as this allows us to submit a verifiable report to the Vatican. If you would like to submit a prayer request, you may do so here. Father Peyton’s story shows us the impact of examples who model an enthusiastic faith. God used Fr. Peyton’s parents’ commitment to family prayer and the Rosary to mold their son in holiness. His Marian devotion grew due to the encouragement of Father Hagerty…Since I have been a member of and now serve as president for the Notre Dame chapter of the Militia of the Immaculata (NDMI) and as a catechist in a local South Bend parish, I find myself in a position where I can encourage others in their Marian devotion and continue to grow in mine, in imitation of Fr. Peyton, who was so humble and total in his entrustment to Mary that he called himself ‘Our Lady’s Donkey.’ May we strive to emulate his zeal for family prayer and love for Our Lady, tirelessly serving as ‘Our Lady’s Donkeys’ in our daily lives. I thank Father Peyton for helping with our Father in heaven for his favors granted that my husband is now praying with me mornings and finding contentment with his life and our marriage. A woman was battling a serious lung issue, and doctors feared the worst. Jaime, her daughter, prayed to Father Peyton for his intercession. “My mom got the results of her CAT scan, and they were good! Thank you Father Peyton and thank God,” she writes. When the success of the pregnancy was in danger, Rachel and her family prayed for a safe birth of a grandchild. The child was born prematurely, but in good health. They are grateful to Father Peyton for his intercession. Husband survived critical illness: A woman from Minnesota writes that her husband had not been feeling well for some time but resisted her advice to see a doctor. She prayed to Father Peyton for his health. When her husband finally went to the emergency room, his blood count was so low that the doctors couldn’t believe he was still walking around. She credits Father Peyton’s intercession for his survival. A man in the Philippines writes to tell us of his sister, who was suffering from cancer. The family couldn’t afford the expensive chemo treatment, and the situation was becoming dire. He prayed the Rosary, asking for Father Peyton’s intercession. After a month of continuous prayer, a stranger called to say he would pay for the four treatments. His sister continues to do well, and the family is preparing for her radiation treatments. A Texas woman needed a financial miracle and prayed to Father Peyton that her house would sell. She writes that her prayer was answered, and she gives thanks to Father Peyton for his intercession. This family is doing what we are asking all those who pray the Rosary at home or in their parish churches to do, namely, to form a Father Peyton Prayer Group by adding the prayer for his canonization at the end of the Rosary and to pray for favors through his intercession. Such prayer groups are springing up all over the country and are yielding great rewards. For not only do their members experience the calming effects of the Rosary prayed together, they also help us lay down the spiritual foundation for Father Peyton’s Cause for Canonization. Furthermore, when they pray for favors through his intercession and ask all of us to join our prayer to theirs, their petitions gain force because they arise from many hearts. Their reports to us, furthermore, provide the evidence of devotion to him that Rome wants and help the Cause along. A couple from New York was working on a project, which seemed in jeopardy. After praying for Father Peyton’s intercession, they received some very good news.